George Edward Lace 96 passed away peacefully at NWMC Hospital suddenly on Friday, 8November 23, 2018. George was born in Granby, Quebec on October 1, 1922 and came to the United States from South Stukley, Canada. He was the son of the late Elward and Lillian (Norris) Lace. He married the late Elaine Mae (Vallee) Lace on November 30th, 1948. They will be married 70 years at the end of this month. George attended the Swanton school system and worked part-time at local farms. After school George enlisted into the United States Army on April 27th, 1944. He was in-ducted into the service at Ft. Devens, MA. He took basic training at Ft. McClellan, Alabama and advanced training at Ft. Gordon, Georgia Army Bases. It was while he was on active duty in Georgia that he became a United States Citizen. This was a very proud moment in George's life. He was naturalized at Macon, GA. on July 8, 1944. George was then sent to participate in the European Theater. He crossed into Europe on the U. S. S. Washington and entered into WWII. He became part of Co. A, 11th Engineer Combat Battalion. Then he was sent across the English Channel to Bastogne. They were attached to the 94th Infantry which went on to South of Anchen in the Ardennes densely forrest region in Northeastern France. George took part in the Battle of the Bulge which was the last major German campaign on the Western Front during WWII. He was part of the Panzer division. He was also part of the Black Bull division which was formed in response to the unanticipated success of the German Panzer Division. George then went on to Austria where he received a discharge in Linz, Austria but he decided to re-enlist to further serve his country. He was in charge of a German prison camp where he supervised a group of German prisoners. On March 12,1947, George received his honorable discharge from the U. S. Army at Ft. Dix, N. J. While in the service some of the awards/medals George received were the Combat Infantryman Badge, Campaign Battle of Northern France Badge, Good Conduct Medal, EAMET Medal, WWII Victory Medal, and the Rifleman and Marksman Medals. Many years after returning home George received a letter of appreciation from the French Embassy and a accommodation award for his participation/service in the Battle of the Bulge. George was very proud of his military service and quickly joined the V.F.W. Post 758 and the Ämerican Legion Post 1 both of St. Albans. George was award a certificate for his continuous membership in good standing with Post 1 accumulating 69 years with this organization. George returned home and settled into St. Albans in 1947. He was hired by the Central Vermont Railroad for the Bridge and Building gang in May of 1947. He ended up retiring from the C V. R. R. with 35years service. 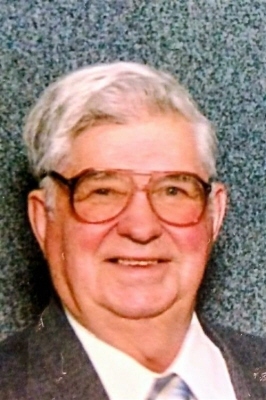 He married Elaine Vallee in 1948 and started his married life and to raise his family. During those years George became very active in the St. Albans Boy Scout Troops both Troop 1 and 40. He became an assistant leader, a leader, then a Neighborhood Commissioner for many years. He received a plaque from Bishop Joyce of the Burlington diocese for his many years of work with the Scouts. He also received the Order of the Arrow award. George loved the outdoors, hiking, knot tying, and building anything from benches to buildings. He loved sharing his talents with the Scouts and he really enjoyed spending time at Mt. Norris Boy Scout Camp in Eden, Vt. He also enjoyed spending time with animals. He had an extreme love for dogs. He was very active in the Franklin County Humane Society. He was very instrumental in the purchasing of the land and the building of the animal shelter in St. Albans. He was given a small office so he could store his tools at the shelter so he could come into the shelter to make repairs as often as necessary. While stopping in to make repairs he would bring dog treats to give to each dog in the shelter and "chat" with each dog every time he entered into the building. He was on the Board of Directors and the Shelter Committee. He was awarded the Volunteer of the Year Award in 1993 and his name was placed on a bench in front of the shelter in honor of the Volunteer time he gave so willingly. George spent the last 4 years residing at the Franklin County Rehab Center and made many new friends with visitor and staff during this time. He loved the entire staff and enjoyed many activities with the team members. George was preceded in death by his parents Elward and Lillian (Norris) Lace, Step-Father Charles Barney, wife Elaine (Vallee) Lace, brother Wallace Arthur Lace, and two sisters Doris Mildred (Lace Underwood and Elaine Audrey (Lace) Begnoche. He leaves his daughter MelodyAnne and her husband John Thibault of Swanton, and a son Carter Erick and his wife Jill Lace of Winnetka, CA., his grandchildren, Brent Cornell Rouse, Brad-Travis Aaron Rouse, Tiffany Lace, Kelsey Lace and Courtney Lace as well as his great grandchildren, Katrina Possiant, Olivia Creller, Araya Sunshine Rouse and Gavin Michael Rouse. Relatives and friends are invited to attend calling hours on Friday, November 30th, 2018, from 4:00 - 7:00 p.m. at the Brady and Levesque Funeral Home, 86 South Main, St. Albans. A funeral service, burial with military honors, and a reception will be held in the spring. Donations may be made to the Franklin County Humane Society or the Franklin County Vermont Honor Detail of Vermont. Arrangements are entrusted to the Brady & Levesque Funeral Home, where online condolences and memories may be shared with his family at: www.bradyandlevesque.com. To plant a tree in memory of George Edward Lace, please visit our Tribute Store. "Email Address" would like to share the life celebration of George Edward Lace. Click on the "link" to go to share a favorite memory or leave a condolence message for the family.